I used MFT's Clearly Sentimental About Grandparents for the sentiment, die-cut some flowers and leaves with my newest Die-namics, and added some ribbon. Tip on the rolled flower dies....after cutting and embossing them through the Cuttlebug (or whatever machine you use), crumple them up in your hand, unroll the crumpled CS, and then roll it smallest side to largest. Also, when rolling, keep it a little loose vs. rolling it super tight. and our August guest designer, Vickie Zimmer! The stamp set is Garden Picks, the main image is stamped on Classic Ivory CS, and colored with Copics (Leaf Green and Lilac Collections as well as B00 and B0000 from the Ice Blue Collection). The main image was cut out with a Spellbinders circle die and popped up on foam tape. I have a girlfriend who will be celebrating a birthday later this week....and she's a total 80's girl so I think she'll get a kick out of this image. Papers are My Mind's Eye and the image was colored with Copic markers. The layout is Deconstructed Sketch #64 and the card measures 5" square. FTTC183 "Butterflies, Bees, Spiders, Oh my!" This week's Timeless Tuesday Challenge from Maki is a fun one...."Butterflies, Bees, Spiders, Oh My! "...use an insect image and/or elements for your card or project. So anyway.....you didn't come here to listen to a bunch of rambling. You came to see a card, right? Okay, here's one I made for Kara's new teacher using an a la modes girl that I bought from MFT (my very first a la modes girl)....this one is called An Apple for Teacher. Papers are by My Mind's Eye (Sweetest Thing--Honey) and the layout is this week's Wednesday Stamp Club Sketch. the tab, scalloped border, flower, and leaves are all MFT Die-namics. Oh, and I also added some Stickles to the image (the apple leaf, her belt, shirt cuff, earrings, and hair band. Thanks for stopping by and I'll be back on Tuesday with the new Friends of Flourishes challenge. At 2PM, 4PM, 6PM and 8PM (Central Standard Time), Flourishes is going to be ushering in some fun-filled challenges and YOU could win some fun prizes! Are you ready for the 2PM Challenge? HOW TO PLAY: This challenge is sweet as can be -- just use a focal image or sentiment that is SWEET! Just that simple! Use Flourishes stamps if you have them -- your entries will count twice. If you don't have Flourishes stamps, play along anyway, you could win some! If you upload to SCS, please use the keyword FLLCIS5A. You have until August 31st to enter and can enter as many times as you like! Some of our designers have helped us celebrate with a little sweetness! I chose to use my Strawberries set and used the "you're so sweet" sentiment from the set. The layout was Fall-to Layout #202 from the Clean and Simple Blog. The strawberries were stamped on Classic Ivory CS and then colored with Copics (Poppy Collection, Leaf Green Collection, Buttercup Collection, and C1). Simply create a card using a sweet sentiment or image! Please DO NOT combine challenges. We’ll announce the winners Tuesday, September 4th at noon CST! HOW CAN YOU WIN? Play in this challenge and that counts as one entry for a stamping prize pack (including stamps and other goodies!) Play in all five and you will be entered toward our grand prize! Winners will be drawn randomly but if your card is one of our designers' faves, your work will be added to our Customer Cards Gallery on Pinterest for all to see! So get those fingers inky and join us for our birthday bash! Hi all! Flourishes is celebrating a birthday this month and today there are going to be FOUR different challenges throughout the day. 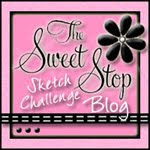 The first challenge is live right now on the Flourishes Blog and the theme is "Sweet Celebration." 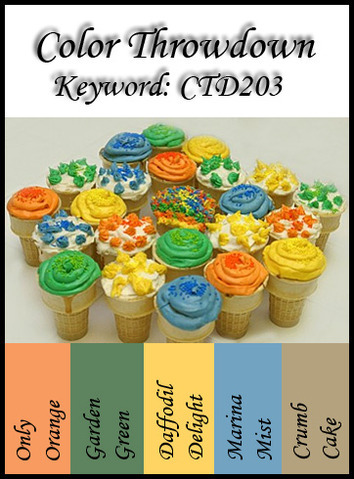 All you have to do is add something "sweet" to your card or project. Hi everyone! 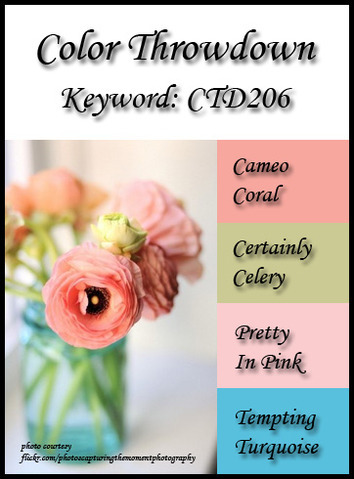 Here's my card for today's Color Throwdown challenge. Joan is our hostess this week and she picked white, pool party, lucky limeade, wisteria wonder and pumpkin pie (or you can use something close to those colors). Click HERE to see the inspiration photo on the Color Throwdown blog. For my card I used certainly celery, cool caribbean, almost amethyst, and pumpkin pie. The rolled flowers were made with an MFT Die-namics, the leaves were cut with a PTI die and embossed with my Swiss Dots embossing folder, the butterfly is a Martha Stewart punch, and the cool caribbean frame was cut with a romantic rectangles die from Spellbinders. The sentiment is from MFT's Polka Dot Greetings set. and our August guest designer, Vicki Zimmer! For my card, I used the brand new Country Road set from Flourishes. The main image is up on foam tape to give it some dimension. Hello there and happy Wednesday to ya. 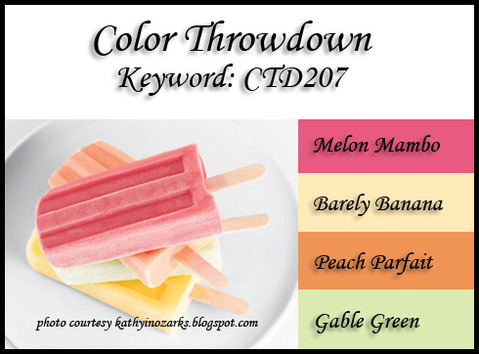 It's time for this week's Color Throwdown (CTD204) and Broni is our hostess this week. I used Verve's Flutterby die and this thank you sentiment that I received in one of my orders from them. The layout is Mojo Monday Sketch #252 and my card measures 4.25" square. There are two die-cut butterflies; the second one is up on foam tape. The clouds were cut with MFT Die-namics from vellum. I used my With Gratitude set from Flourishes, colored the image with Copics, and popped the scalloped oval up on foam tape. We have some exciting news with this week's challenge as well....the super talented Broni Holcombe is joining us on the FTTC team!! Whooo-hooooo, love her style!! Be sure to stop by and see what the rest of the Timeless Tuesday ladies have created for you today..... Allison, Amanda, Broni Cindy, Heather, Makiko, and our August Guest Designer Sasha Holmes! Because it's release week, some of the Senior DT members are joining us for today's challenge as well...Stacy, Silke, Cindy, Jan Marie and Julie! Have yourself an awesome Tuesday! Hi all and happy Sunday! I just bought a bunch of different MME paper pads and I couldn't wait to cut into some of it....have to say, it was hard to decide on WHICH pack to start with...but I ended up picking patterns from "A Mother's Love." The layout is Deconstructed Sketch #63 and I picked my "You Make the Grade" PI girl for this week's Paper Players Challenge. The PI girl was stamped in Memento Tuxedo black, cut out with a Spellbinders Apple die, sponged with Tim Holtz Tumbled Glass (with the apple die in place), and colored with Copics (0, W1, W3, W5, E00, E02, E11, E13, E31, E33, E35, E37, E51, YR65, G20, YG63, AND YG67). The apple is up on foam tape and the A+ oval is up on a second layer of foam. Thanks for stopping by and I hope you have a great Sunday! Whoooo-hoooooo! I'm so excited to tell you that I've been asked to join the Color Throwdown team!! Fun Fun FUN! I used the new Dream Big set from Sweet 'n Sassy Stamps, patterned papers are from Simple Stories Summer Fresh, CS colors are brocade blue and kraft, and I used some PTI orange stitched ribbon. The green mat and blue mat behind the main image are both up on separate layers of foam tape. The image was colored with Copics (YR04, YR21, YR24, B21, B23, B24, YG11, YG13, YG17) and I added Kaiser pearls to the centers of hte flowers. A couple extra flowers and the butterfly were stamped a second time, colored, cut out, and glued onto the base image to get that "out of the box" look. The layout is Deconstructed Sketch #62. ...and our August guest designer, Vicki Zimmer!